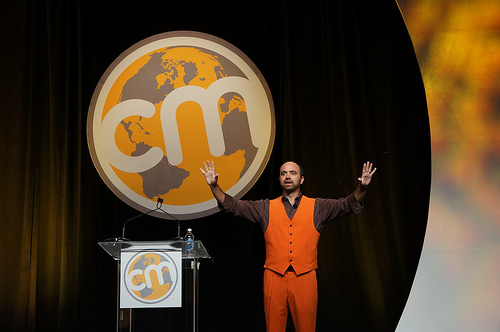 Joe Pulizzi and his Content Marketing Institute team have built a community of professionals that descends on Cleveland every September for Content Marketing World (aka: #CMWorld). Beyond the high quality, must-see content and the ability to connect with content experts, Content Marketing World speakers, exhibitors, attendees and staff are most notable for their use of orange. The orange starts to appear as you land in Cleveland, home to the Rock and Roll Hall of fame. Orange and grey signs, strategically placed along the corridors as you make your way to local transportation, welcome you. Content Marketing World’s unstated dress code is: Wear orange. While some of my peers find this orangeness silly and childish, the use of orange builds brand and community at the same time. But it serves a more important marketing goal. 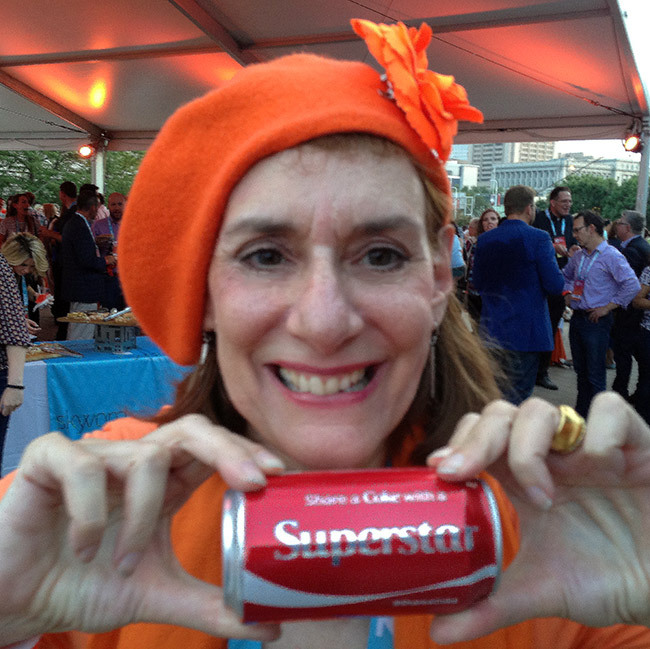 Want to spot me at #CMWorld? Look for my orange beret and shawl. Even better, orange clothes and accessories aid attendee education and socialization. Beyond these live event goals the orange clothes help build Content Marketing Institute’s their brand and more importantly their community of fans. 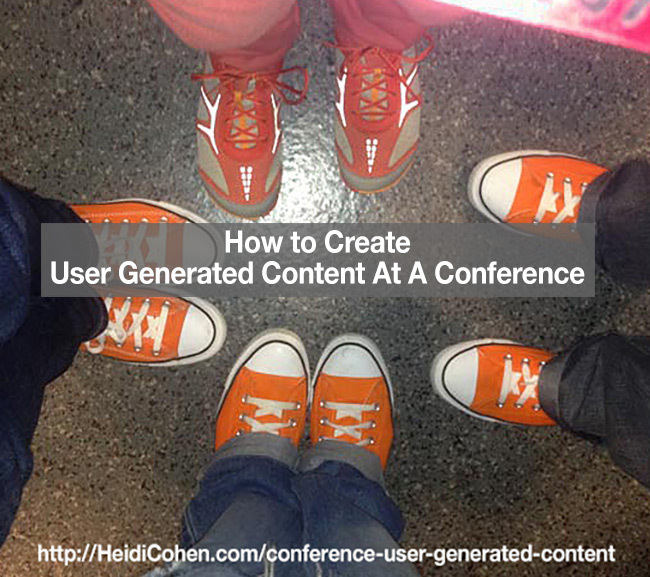 For Content Marketing World 2013 I decided to create some fun conference user generated content. To this end, I wanted to spotlight my orangeness and my knitting skills. So I knit 2 orange cowls to use as props in attendee photographs since visual content is highly sharable. Unfortunately, filed away on my computer, this fun content never saw the light of day although the photos have lingered. As a result, I decided it was time to reveal my orange cowl conference user generated content. Timing be dammed! 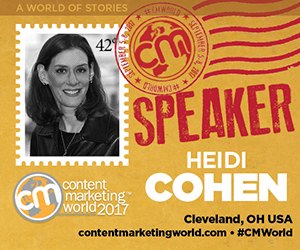 Despite their age, many of the photos feature #CMWorld regulars so it’s still relevant. From a marketing perspective this eye candy, fun content that Jason Miller calls chocolate cake content (Hat tip: Hubspot) plays a key role in your live event content marketing. Provides “free” user-generated content incorporating your brand. Even better, it’s positive. To maximize results, you have to reuse and repromote it. Where possible, get creators’ permission to use and/or rehab it. Builds audience trust. Don’t underestimate how important this is. This content is a visual symbol of your community. Encourages others to want to be a member. Taps into influencer marketing. As micro-influencers, everyone in your photos will share your content. Conference user generated content is core to your content strategy. But for your conference it’s much bigger than just content marketing (Sorry Joe!). Done well it builds your brand and your community by creating real life engagement. Even better for attendees, it helps you to connect with influencers in your category and to get some glow from their reach. This is especially critical in today’s marketplace your customers and others own your brand. Unfortunately it’s not always positive. Having a secret brand handshake like wearing orange clothes builds bottom line equity. The sense of community wearing orange clothes builds is marketing nirvana. Even your potential audience wants to belong and stand out as part of your brand. Photo Credit: Heidi Cohen. You are free to use these photographs as long as you link back to this article. Tags Aaron Orendorf, CMWorld, conference content, Joe Pulizzi, Live Event Content, User generated content. Bookmark the permalink.